In the fast-paced world of raptors, large size doesn’t always translate to might. I was on a routine visit to the Coastal Lagoon at Manila Bay to check out the water birds when I saw four Ospreys fishing at mid-morning. With the light already too harsh for shooting good photos, I settled on filming the Ospreys as they repeatedly dove into the water to try to grab some fish. Here are some footage of one of the Ospreys dive-fishing. Suddenly out of nowhere, a Peregrine Falcon appeared and started harassing and chasing the larger raptors! 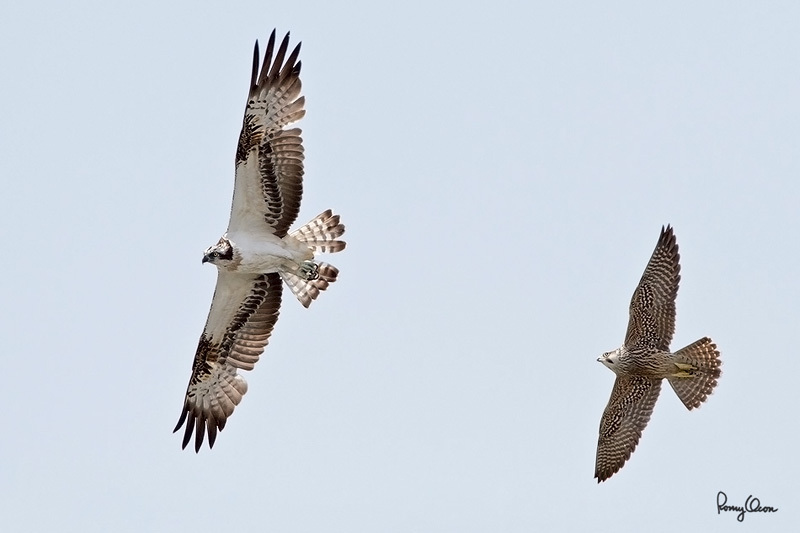 The larger birds’ wingspan is about 1.35 m while that of the smaller bird is circa 0.915 m. The Falcon zeroed in on one of the Ospreys and literally flew circles around the larger bird, not unlike a jetfighter buzzing a heavy bomber. I was awe-struck with the spectacle, but I had enough presence of mind to switch my gear to a flight-shooting mode from filming mode. One frame from a long burst miraculously got both birds within the DOF, but this was more due to a happy accident than a result of my shooting proficiency. Habitat – Associated with water both along coast and inland. Habitat – Wide variety of habitats, from along coasts to high mountains. Shooting Info - Coastal Lagoon, Manila Bay, Philippines, January 4, 2011, Canon 7D + EF 500 f4 IS + Canon 1.4x TC II, 1/1600 sec, f/7.1, ISO 400, manual exposure, 475B/3421 support.